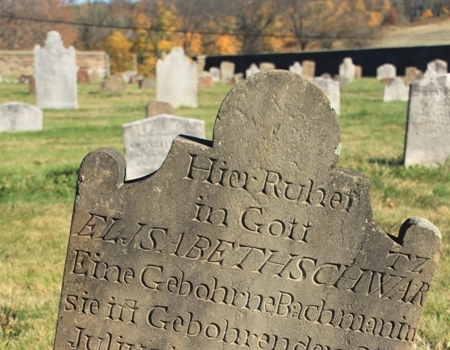 Most 18th-century Mennonite gravestones did not carry decorative images, but several stones at Deep Run include carvings of crowns and tulips. A crown for Maria Oberholtzer, 1758; one of the earliest surviving stones in the cemetery. In early years, before marble and granite were widely available, graves were marked with red shale or other local stone. A crown for Barbara Albart, 1764. Crown and tulips for Barbara Kolb, 1765, widow of immigrant bishop Henry Kolb. A tulip for Magdalena Leatherman, 1770s. A stylized crown (or tulip?) for Henry Loux, 1791. A stylized tulip for bishop Jacob Gross, 1810. Here we begin to see the finer calligraphic text that appears on 19th-century stones. Some fraktur artists were also stone cutters, creating these beautiful inscriptions. A finely engraved stone for Elizabeth Bachman Swartz, 1812.
of May in the year 1812. Here lies buried Abraham Landes, 1831 (son of deacon Rudolph Landes). By the mid-1800s, most people at Deep Run were having their stones inscribed in English. But some members of the pious Gross family continued the tradition of German fraktur inscription. In the case of preacher Christian Gross, who died in 1865, even old-fashioned shale stone was used. The stone for Christian’s son, preacher John Gross (here called “Rev.”), is the last German gravestone in the Deep Run Cemetery, dated 1903. Grazing sheep kept the grass down at Deep Run before the rows of old stones were straightened. Photo by Walter Rush, 1949, Mennonite Heritage Center Collection. Daryl Rice’s photos have been added to the Deep Run listings on Find-a-Grave by MHC volunteer Bud Gross. The second set of photos is from Kevin W. J. McCoach, who documented the “fieldstones” (early locally-quarried stones) in the Salford Mennonite Cemetery as part of an Eagle Scout project in 2015. Unlike at Deep Run, there are almost no decorated stones surviving at Salford, with the exception of this tulip for Anna Kratz, 1793, daughter of immigrants Gerhart and Anna Clemens and wife of immigrant Valentine Kratz. Kevin McCoach photographing the Anna Kratz gravestone. Kevin also raised funds to install a monument with text by John Ruth, explaining the historical significance of the congregation and cemetery and listing some of the early families buried there. You can read about the project and see all fieldstones with transcriptions in this document compiled by Kevin. Stone for the monument came from a nearby quarry. Placing the monument, November 11, 2015. Folk art painting by Isaac Clarence Kulp of a sexton digging a grave beside the 19th-century Salford Meetinghouse. Mennonite Heritage Center Collection; gift of John & Roma Jacobs Ruth (2008.24.1). The new meetinghouse built at Salford in 1924 was situated with the pulpit facing the cemetery rather than the road. Puzzling to modern visitors, this arrangement was requested by preacher Henry Clemmer, whose argument was: “I’ve always preached to the whole congregation!” Photo circa 1942. Mennonite Heritage Center Collection. Very interesting article. I am so glad that the tombstones are photographed and made public. What a wonderful and thoughtful project that Kevin McCoach did. Perhaps other people will do similar projects for other congregations.